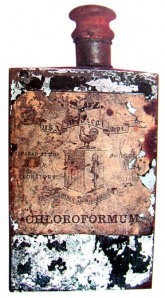 Chloroform, an anesthesia, such as once contained in this 1863 Union tin flask, was routinely available to Union wounded, particularly those facing extensive surgery or amputation. Confederate doctors also had it, at the beginning of the war, but by the time of Fort Sanders they had to make do with syrup of opium, if they had any, or, more likely, whiskey. Chloroform had the advantage over gaseous ether of being non-flammable, so that it could be used at night when oil lamps or candles were lighting the surgery. Ether was first used by U.S. military surgeons in the Mexican War of 1846 and chloroform soon after. Chloroform was poisonous, however, and could kill if used to excess. 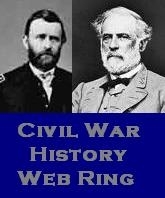 This entry was posted in Civil War accoutrements and tagged anesthesia, Union army chloroform. Bookmark the permalink.